Chicago | Reuters — MGEX spring wheat futures plunged two per cent on Tuesday to their lowest levels since July 2018 on easing concerns about the weather in key U.S. growing areas and weakening cash prices, traders said. K.C. hard red winter wheat futures also were weak, with a better-than-expected government report on crop conditions pressuring prices. 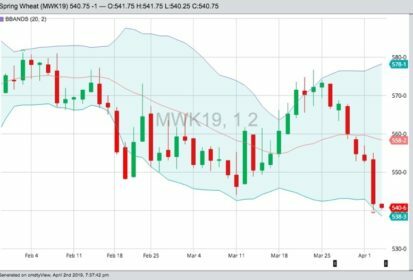 Chicago Board of Trade (CBOT) soft red winter wheat contracts firmed on a late round of short-covering after trading in negative territory for much of the session. Soybean futures rose, with the market underpinned by recent export sales to China, while corn eased on pressure from the weakness in wheat. In its first crop condition report for this year, the U.S. Agriculture Department on Monday afternoon assessed 56 per cent of U.S. winter wheat in good-to-excellent condition, up from 32 per cent a year ago and topping trade expectations of 55 per cent. “The crop condition report showed that wheat was much better than a year ago,” said Chris Lehner, commodities broker with Archer Financial Services. The weather outlook also boosted expectations of strong harvest yields, adding further pressure to wheat futures. Forecasts for improving weather in the northern Plains, where the spring wheat crop will be seeded in the coming weeks, eased some concerns about flooding in key production areas. MGEX spring wheat for May delivery dropped 11-1/4 cents to $5.41-3/4 a bushel (all figures US$). Many spring wheat contracts hit new lows. K.C. hard red winter wheat for May delivery was off 1-1/4 cents at $4.33-1/4 a bushel. CBOT May soft red winter wheat, the most actively-traded wheat contract, was 1-1/4 cents higher at $4.64 a bushel. CBOT May corn was down 1/4 cent at $3.61-1/2 a bushel while CBOT May soybeans were up 4-1/2 cents at $9 a bushel. Chinese Vice-Premier Liu He is in Washington just days after wrapping up trade talks last week in Beijing. He will meet with U.S. Trade Representative Robert Lighthizer and U.S. Treasury Secretary Steven Mnuchin. — Mark Weinraub is a Reuters commodities correspondent in Chicago; additional reporting by Naveen Thukral in Singapore and Michael Hogan in Hamburg.